That’s what the brochure said in my dream. It was a destination you could go and do actual full immersion role playing of whatever animal you wanted to be. How cool is that? Sure, cats are easy. Many people don’t have to do a lot to mimic the life of a cat. How hard can it be? You lie around and cop an elitist attitude when needed. You purr when you want something. An easy stretch, don’t you think? Dogs aren’t too much harder; you just need the right skills. Have you ever worked? Then you have the right skills to play the dog. Look at all those employees with their ever-hopeful puppy dog eyes fully looking for that promotion or pay raise that never, ever comes! How much more dog-like does it get? Well, don’t forget about fetch! Getting your boss a Starbucks is no different than throwing Spot that stick and making him chase after it to bring it back. And if it’s not coffee than it’s a report, or a meeting or something stupid you have to do to appease. But Animal World allows you to go and mimic other more interesting animals. Take camels for example. You get to spit with complete indiscretion. We’ll prep you by not allowing you to shower for a week. We’ll put you into a giant oven we have on low heat and full of sand. There you’ll get to slog around having pre-drunk a gallon or two of water. Go ahead, grunt, fart, belch! I mean you’re gonna be flippin’ hot and pissed off wearing our camel fur anyway; oh yes, you’ll be in full camel mode by the time you leave! The monkey jungle is a great way to have fun and simulate what its like to live as one of our distant relatives. Apparently for some it’s not quite that distant either. You can swing on the vines and if you fall our unique trampoline floor will bounce you right back up to start again. Have a great time flinging your poo at other guests and find that one special guest and groom their hair for hours on end. Sure, you can be a deer. We’ll let you hide and make a stealth camp inside the nettles deep in the forest. You can lap up water from the stream and later you get to run with the herd while they flee in panic hoping that a predator doesn’t single them out. Think of it as life and death tag. We’ll even take your picture through our nifty antler mount in our photo den. And yes, you can even be a predator. 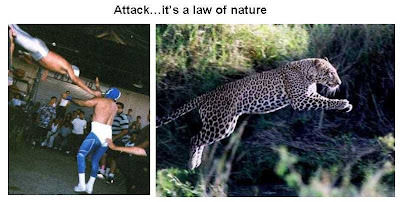 Due to insurance and health reasons you can no longer actually hunt down tourists and bite or eat them. But you do get to chase them around and take them down. Don’t worry, we have many guests that like to be submissive and play the herbivore. Playing the predator is a very popular choice among bullies and lawyers. And as for VE, what animal does he aspire to be? Easy…the sloth! They make cats look productive. Me for the herbivore. But I think I'll fake disease so I don't have to do all that running. Oh wait, that wouldn't stop the vultures or the hyenas, would it? But who would pick those? Theme Thursday has got to stop giving you a five day lead-time. Because oh, the places you'll go! Oh, VE. This is wonderful! The comparing photos are so aligned. "...actual full immersion role playing of whatever animal you wanted to be." You and I had similar takes on the theme this week. Way differnt ways of getting there, but still similar immersion themes. Is "Evolutionary Man's" hair real? Is wearing undies? I am wearing bifocals and it is still hard to tell. My god. That dude in the monkey photo needs to invest in a razor or some wax or something. It almost looks like he's wearing a jogging suit. That would make Obama a Buzzard of some sort wouldn't it? Okay, the beaver one got a big laugh, but I have to say Ronda's underwear one got an even bigger laugh. I did not even think about the underwear. No wonder you two did almost the same kind of thinking for TT today. She had farting of the brain and is something you would normally come up with. I think she is starting to read you too much. Oh well it is great. I loved this one. Really funny and good pictures. Have they done any brain scans of what is going on in your head. They really need to. It must never stop working. Hmm, wonder if you ever kept a journal of your dreams. Oh my, that would be worth publishing. If I could be any animal, I'd be the guy who's banging Jessica Alba. BTW cheers on the book! baino - Yeah, at least we don't have to get up and worry about whether today is the day we'll get eaten. fundamental jelly - Exactly. How great is that? moooooog35 - How can I argue with that? I agree! chris - Actually, I have tried your food. Nine straight days in London trying to find some damn decent restaurant! What's up with that? I want to be a blue whale. Excuse me while I pause here to mark my territory. incredible woody - Awww...don't be blue...be happy! Happy Whale! roy - Now there's an animal instinct that humans haven't dimminished one bit. Good call! I'd opt for being a croc or snake. Lying round most of the day, basking in the sun. And able to down your prey in whole! LOL on the beaver. A friend of mine went to Beaver College (down in the Carolinas ). They have since changed the name. subtorp77 - Ha! As a high schooler I dreamed of beaver college! As for a snake, not for me, sure...you can down your prey in hole but then you gotta slog around for three days feeling like it! Great post... hard to choose, but i will be an eagle today. You omitted the bunny rabbit! I’m kind of partial to their lifestyle - except for the excessive breeding part. First of all....now we can see why you chose Mrs. VE to be Mrs. VE. Quite a spitter that gal! Second of all....an updated pic of VE? You've got the hairy body of a man that ONLY Mrs. VE could love. Good one VE. Sorry I haven't been around this last week. The wife has me working on a remodeling project. You know, kind of like how the queen ant has all the drones do all the work? beth - Yes, I could see you as a bunny! No...I wasn't even going there!!! gladys - I can't bear to think of it! ha! quirky - Aack. I'm all out of order on my return comments. Ha! Nice try. The wife-poo is blonde. But the spitter can hang around if she likes; I won't hold it against her. As for hair...I'd be waxing that stuff off permanently! Yikes. That hairy man was disgusting. Ewww! I should also add that I've always wanted to be like a puffin, but until now, never found the inspiration to pursue that dream. Thank you VE. marianna - Sometimes we gotta step into the shoes of others! Thanks. freetheunicorns - There will always be a place for your puffin dreams at Animal World! I have no idea what a puffin does but I like the name! I finally understand. We truly have not evolved and I think some of us may have gone backwards. May you be reincarnated as a camel. Love the post! I think I would want to be one of my dogs. They're spoiled rotten! It's funny you noticed that about the eagles. Whenever a relative comes to town and really wants to see a bald eagle, we go to the dump. There are at least 100 of them there! reforminggeek - Camel? Sloth please. Actually a camel doesn't sound so bad right now...I could use some hot sunny weather! Great post,lol,I enjoyed that very much! Nice juxtapositions of the images. Is that guy really that hairy? That made me smile. Laugh, even. The picture of the two monkeys (or was that one monkey and one man?!) especially. Oh dear! giggle pixie - Sorry...already mine! Do you aspire to have three toes, too? what about the lemmings? the sheep? the octopi? and what can you do if i want to get down with my platypus self? anne - I'm gonna have to nix that much immersion I'm afraid. How would I be able to count to 10? I reckon that beavers are terrific. They seem to have great personalities. Oh, that hair picture is hitonious. nessa - Like that one eh? Sort of makes Burt Reynolds look like a naked mole rat! So which animal swallows? Oh that's right, Paris Hilton. fun post... and that is a cute sloth picture! Ewwww...that hairy guy.... please tell me that's a costume or Photoshop. Oh how hysterical your photos! Are you REALLY a sloth? I think not. Interesting post! I like the comparisons. patrice - Thanks. It seems couch potatos are instinctive! mama k - I have a thing for sloths! dakota bear - Thanks. It was fun. The hardest thing about imitating my cats is squatting over the litter box... and reaching around to bury whatever happens. And don't even get me started on the whole "hygiene" thing. janna - Yes, the whole litter box thing won't do at all! ha! Love the one about survival. Can I be a loonie. Okay. I could have lived without seeing that hairy man. Yuck! It would be elephant for me. Lots of water and food. Lots of random stampeding and smooshing of things. No jumping involved. perpetual chocoholic - Oh come on now, he's your new postman! So far this year this is my fav post of yours! I'd be an octopus, I have many parts of my proffesional life that require me to fit into spaces an eighth of my actual size. I Am A Mole And I Live In A Hole ! tony - Excellent! And it rhymes! That hairy man was really kind of creepy. The monkey was much cuter. 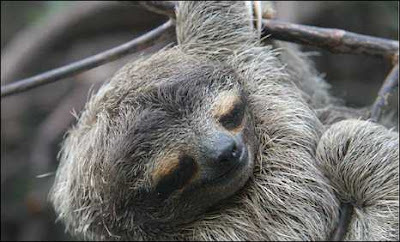 serena - You can join me with the sloths. We'll be doing absolutely nothing! Cats and sloths exist for the same reason...to show us how dispensible we really are! count sneaky - And we never learn, do we? Good call!